Today marks the first day in a week-long blog series on book marketing plans. In addition to sharing some background on what book marketing plans are all about, I'll also release a few fun tools and resources to help you create your own. Let's kick things off with a quick introduction to book marketing plans. Who needs them? What can they do for you and your books? And when should you worry about writing one? Who Needs a Book Marketing Plan? Are you an author? Do you hope to sell your books as opposed to writing solely for yourself, family, and friends? If you answered "yes" to both of those questions, you need a book marketing plan. Trying to sell your books without a well-thought-out plan is like jumping off a ship in the middle of an ocean without a life preserver. Unless you're some kind of super-human, eventually you're going to drown. That could mean anything from drowning in unexpected costs to unforeseen levels of competition. What Can a Book Marketing Plan Do For You? A marketing plan gives you direction. It helps you more efficiently market your book by keeping you focused on the right audiences, channels, and tools. Your book marketing plan helps you move from general goals to specific tasks. In other words, it helps you figure out where and how to spend your time to make your goals a reality. It also helps you schedule those tasks. It will help you figure out whether or not a market exists for your book. You can't set sales goals without knowing if a market even exists for your specific book or series. Marketing plans help you figure out where you stand among your competition. Your book will compete for readers' attention. Knowing your (and your competitors') strengths and weaknesses is vital if you want those readers to buy your book. A book marketing plan will help you keep costs under control. Marketing effectively costs money. Having a solid plan means you won't waste money on things that aren't likely to work for you and your book. That's just a start. Your book marketing plan should also help you determine your pricing strategy, decide on distribution options, choose the right book cover design, and much more. When Should You Create Your Book Marketing Plan? A book marketing plan should never be an after-thought. You don't wait until your book is already available for sale before writing one. In a best-case scenario, you'll create your book marketing plan before you invest time into writing your book. As mentioned earlier, your book marketing plan helps you figure out if a market even exists for your book and, if so, whether or not that market is over-saturated. Remember, this isn't solely about writing something that you want to write. It's also about writing something you can sell. And if your goal is to sell books, you have to write what people currently want (or need). That's not to say you shouldn't write something solely for the love of it. Passion projects are great in their own right. And sometimes passion projects are also profitable projects. But if you care at all about book sales, it's smart to know what kind of market exists up front. At least then you'll make better-informed decisions about what to do with your book after you've published it. Have you already released a book, but you didn't create a marketing plan first? While that's not ideal, you're now in a better-late-than-never situation. Creating a book marketing plan now won't help you build pre-launch buzz, but it might help you make the most of any further promotional efforts and re-evaluate decisions that aren't working for you as much as you'd like. Another way to look at what a book marketing plan can do for you as an author is to think about the traditional marketing mix -- "The 4 Ps of Marketing." Price -- Your cover price, distributor discounts / royalties, payment options for direct sales, discounting and sales, competitive pricing, etc. Promotion -- The strategies and tactics you use to spread the word about your book and make your target readers aware of it, where they can find it, how much it costs, etc. Your advertising, marketing tactics, sales tactics, and PR strategy fall into this group. None of these things should be decided on a whim. And as you can see, your marketing plan covers much more than a list of promotional tactics (a mistake I see new authors make all the time, and why they tend to follow the crowd by spamming social networks and running poorly-targeted author blogs). 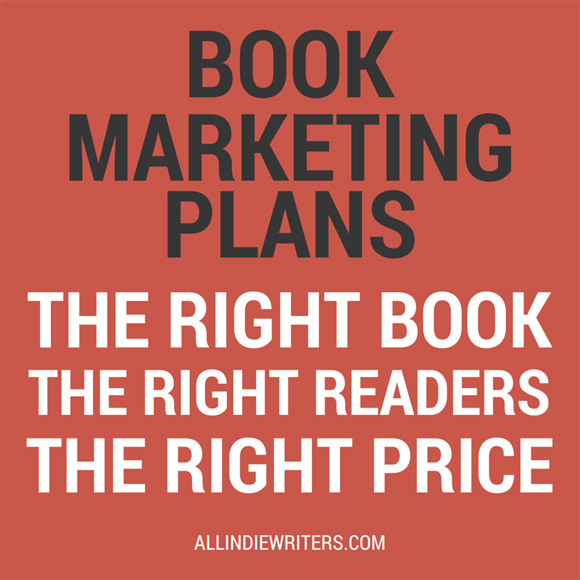 Your book marketing plan is the tool that can guide you in making the best decisions about how to get your book into the right hands, at the right time, and at the right price. It can be the difference between bestseller status and a book that fades into obscurity before it ever takes off. Don't you want to give your next book its best chance to succeed? Check back tomorrow for the next post in the week-long book marketing plan series. In the meantime, leave a comment and tell me about your experience with book marketing plans so far. Did you create one before writing your book? Did you wait too long and not make the most of your marketing plan? Did you neglect them altogether? What worked well for you, and what would you do differently if you had the option?